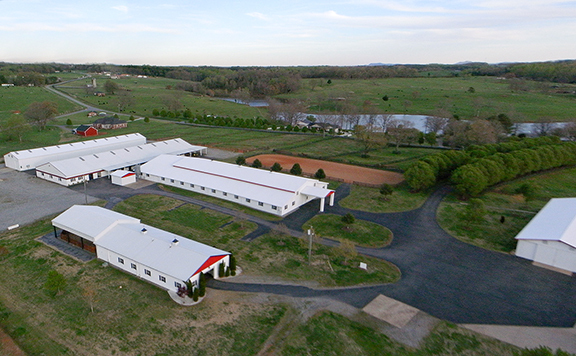 River Taw Farms is located in the foothills of the Blue Ridge Mountains, right where Cleveland, Gaston and Lincoln Counties meet in the rolling piedmont of the southwestern portion of North Carolina. We manage over 3,000 acres of pasture, grass crops, trees and natural water, making us one of the largest farms in the Carolinas. Our vision is to operate a viable scale farm committed to natural sustainable practices and shunning the use of chemicals, growth hormones and antibiotics. We are committed to treating all of the animals in our care in a humane and respectful fashion. We hope to eventually include agritourism, community outreach and education as part of our daily operations. The land we have acquired since 2008 is being converted from many previous uses. These uses included a nationally recognized halter-horse breeding farm, an 18 hole golf course, a school, crop farms and many small family farms left idle or rented out for over a generation. Much of the land we have acquired has needed significant attention. We have had to bring the soil to an acceptable level to sustain grass crops and cattle grazing, fence or re-fence pastures to safely breed cattle and permit rotational grazing. We have also had to remove hundreds of tons of garbage and abandoned buildings and equipment. Fresh water access has been installed across the farm to enable us to remove cattle from the creeks and streams. Our first focus was building our closed herd of over 325 cows to create a sustainable cow / calf operation with desirable characteristics. About two thirds of our herd are Registered Black Angus and the rest are commercial cattle where we are crossing the Angus cows with Hereford bulls. We have sourced the majority of our original registered cattle from two great sources - Yon Family Farms in Ridge Spring, SC and Primus Genetics in Millers Creek, NC. The majority of our 15 registered bulls came from Yon Family Farms with EPDs at the very top of the US Angus herd. We have selected these bulls for Calving Ease, Birth Weight, Weaning, Yearling, Milk, Marbling, Ribeye, $W and $Beef. Our animals have a good thick appearance, sound feet and quiet dispositions. We also acquired one third of our heifers from the Yon Family. Primus Genetics had selected cattle from some of the leading Angus herds in the United States such as Stevenson-Basin Angus, Beartooth Angus, Express Ranches, Gardiner Angus Ranch and Wehrmann Angus. At their dispersal sale in November 2008 we selected a diverse group of 68 heifers with traits designed to optimize feed conversion and growth. Our cattle receive a forage diet free of herbicides and pesticides. They are continually rotated to fresh new pastures. Our animals are never held in confinement, never fed antibiotics and never receive synthetic growth hormones. We want to allow them to live the lowest stress and most natural, healthy existence we can. We plant annual drought resistant grasses (including Millet & Teff Grass) and save both hay and silage for winter forage. We have acquired all of the equipment necessary to support our own no-till farming and grass harvesting (mostly American made John Deere equipment). Our name is inspired by a river and its surrounding moorlands in Devon, England. The River Taw rises at Taw Head, a spring on the central northern flanks of The Dartmoor National Park. It reaches the Bristol Channel 45 miles away on the north coast of Devon at a join estuary mouth which it shares with the River Torridge. As it heads north to the sea, the stream picks up headwaters from a number of tributaries and increases its size to become a very famous recreational trout river. Its journey passes through rural Devon, surrounded by beautiful pastures and wooded valley-sides - not unlike the beautiful Cleveland & Gaston Counties countryside.